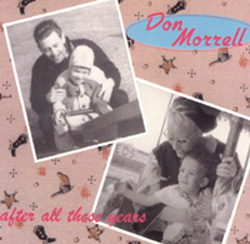 Don Morrell "After All These Years"
Gadfly Records is proud to release "After All These Years," the debut CD release from long-time New York and Nashville singer/songwriter/producer Don Morrell. Morrell, a frequently-noticed denizen of the New York City Americana scene in the '80s (with regular appearances at the legendary Lone Star roadhouse), was consistently partnered with some of the best songwriters/performers around. With his band The Meteors, Morrell made himself known as a songwriter who could tell his story with a beat and a twang (and play guitar alongside anyone). Morrell got the music bug early, after his first time in a studio at the age of eight, watching his father produce a bluegrass duo. He moved into NYC in '75, recording his first project in '76 at Electric Lady Studios. After knocking around New York for the better part of the '70s and '80s, getting involved in various recording and writing situations (which included a production deal at The Record Plant and an administration arrangement with Bob Dylan's publishing company), he started writing and recording with legendary songwriter Otis Blackwell. "I participated in WNEW's 'Prisoner of Rock and Roll' thing. Showed up at the bottom line with a steel player and freaked 'em out." "Someone once took one of those ads out on the back of the Village Voice and had them write : 'Don Morrell, whatever's eating you must have a stomach ache.'" An eye operation kept Morrell from performing for about two years, after which he and Blackwell relocated to Nashville, where they started a production company. Morrell got into the "Nashville co-writing thing," soon writing with a host of Nashville's "A" writers. After Blackwell suffered a debilitating stroke, Morrell eventually entered into a co-publishing arrangement with George Strait's company. During his years in Nashville, Morrell also linked up with Billy Bremner, co-writing and producing demos that led to Bremner's deal with Bluewater Music, and eventually performing as Bremner-Morrell. Morrell has recently relocated to Anchorage, Alaska, where he has been writing, recording, producing, and running a studio (Toneworks Music Production & Recording) with his wife, Linda.